Notary fraud is a major concern in the field of immigration law and Cecilia Mendoza created this map in GEO 441/MPS 552 in Fall 2015 to see if neighborhoods with the highest percentage of foreign-born individuals were disproportionately nearer to notaries than immigration attorneys. Having easier access to notaries due to proximity could indicate a factor that contributes to notary fraud. In order to depict the proximity, dots are used to represent notaries and attorneys within Chicago neighborhoods. Using a "dot density" technique, dots are placed within the neighborhoods where attorneys and notaries are located, in a manner that gives a sense of the density of these services, but does not represent the specific addresses of a particular notary or attorney. 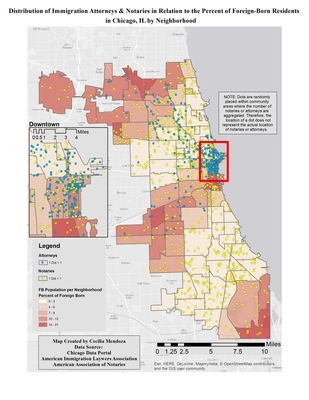 The map shows that there are immigration attorneys located within neighborhoods that have the highest foreign-born populations in the city. However, downtown neighborhoods are heavily populated by immigration attorneys, while neighborhoods in the far north, west, and south where the foreign-born population makes up 10 to 21 percent of the total neighborhood population have far less immigration attorneys in their neighborhood. Additionally, several immigration attorneys do have offices according to where the foreign-born populations live, but notary services are spread across the city and easier to access. It is clear that more immigration attorneys need to establish themselves outside of downtown in order to be able to discourage notary fraud in the west, north and south neighborhoods by being more visible and accessible to the foreign-born populations. The map was created using data from the American Community Survey for the foreign-born population, and web searches for locations of attorneys and notaries on the American Immigration Lawyers Association and the American Association of Notaries websites, respectively. This data was then organized by neighborhood using ESRI Arc GIS 10.3.1.